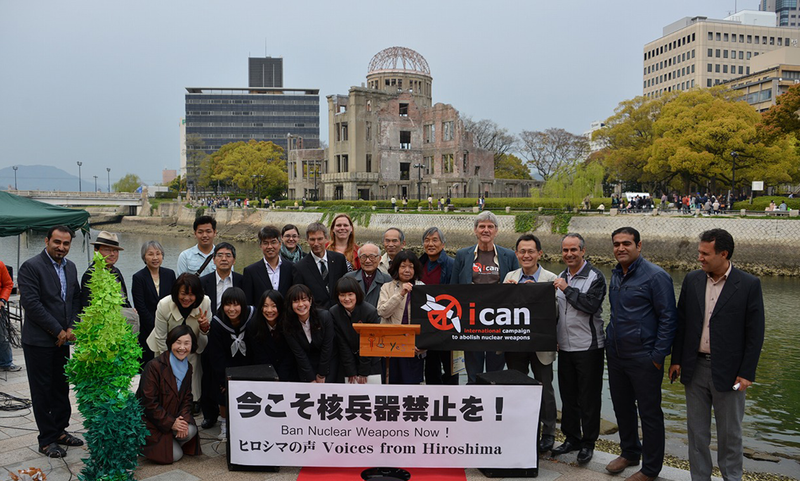 The Japan NGO Network for Nuclear Weapons Abolition is a loose-knit consultative body linking civil society organizations and individuals in Japan who are working to eliminate nuclear weapons. It was launched in 2010 to follow up the lobbying activities by civil society during the course of the Tokyo Forum for Nuclear Non-Proliferation and Disarmament (1998-99) and the International Commission on Nuclear Non-proliferation and Disarmament (2008-10). 4. A regional security system ensuring a peaceful nuclear-weapon-free Northeast Asia. The network organizes opportunities to exchange views between civil society and the government of Japan, inviting both working-level officials and higher-level policy makers to take part. It also promotes advocacy activities for the general public, lobbies Diet members and works with international organizations toward the shared goals. As this year marks the seventieth anniversary of the atomic bombings of Hiroshima and Nagasaki and also coincides with the once-every-five-years Review Conference of the Parties to the Treaty on the Non-Proliferation of Nuclear Weapons (NPT), the network has been working intensively. In April, just prior to the NPT Review Conference, it held a dialogue with officials from the Foreign Ministry of Japan to hand over requests from civil society, followed by a press conference. It also organized a public seminar on September 26, the International Day for the Total Elimination of Nuclear Weapons, working with the United Nations Information Centre in Tokyo. One of the challenges the network faces is how it can better reach out to ordinary people. Since the end of the Cold War era, perceptions of the imminent threat and personal relevance of nuclear issues have receded. Many people seem to at least passively accept the idea that nuclear weapons are a necessary evil. Others seem to feel hopeless and powerless in the face of this vast and complex problem, which they assume can only be addressed by governments and authorities. This also applies to the issue of nuclear energy in Japan, as public interest in the 2011 nuclear disaster in Fukushima seems to have started to fade with time. This makes the voices and efforts of hibakusha, A-bomb survivors in Hiroshima and Nagasaki, as well as survivors from Fukushima more relevant. It is crucially important to learn from them about what actually happened at that time and during the aftermath. The work of the network needs to help communicate their first-hand living memories and cries of the soul and inspire more people to work together to ensure a safer world free from nuclear risks and dangers. Considering what is discussed in the nuclear debates and how people look at nuclear weapons today, the network is working hard to communicate with the general public and media the ongoing humanitarian discourse over nuclear weapons. Such efforts could help the government to go further in working with the international initiative to explore an international legal framework to prohibit nuclear weapons based on the humanitarian imperative. Meanwhile, innovative efforts for a nuclear-free Northeast Asia have important implications for the global efforts to bring into existence a world without nuclear weapons. The network is also shedding light on the issue of accumulated plutonium separated from spent reactor fuel in Japan. Over the years, Japan has accumulated about 47 tons of plutonium, enough to build thousands of nuclear weapons. This situation considerably diminishes the international community’s confidence that Japan will never attempt to develop nuclear weapons, also undermining the existing nonproliferation regime as other countries may want to follow Japan’s example. In this sense, the network is keen to raise public awareness about this issue, including that of Rokkasho Reprocessing Plant, in the context of achieving a nuclear-free world. For further information, please contact nuclear.abolition.japan@gmail.com.